While picking through a garage sale, I found this lovely ceramic pot and set of four mugs for only $3.00. I love the way the ceramic holds the heat and the smooth surface of the handle in my palm. Each morning, I pour a mug of tea to soothe myself and prepare for the day. Typically I check email, read a few blogs, listen to the radio and peer out my window at the birds at our feeders. The house is quiet which is a nice change from the constant cacophony of sounds that fills it the rest of the day. 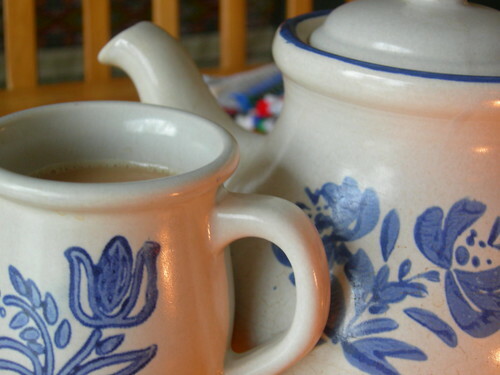 Today’s blog post is a reminder to you to take time for tea. No need to set the table or find the right poetry books. No need to share your pot with anyone else. Find a private moment to sip, to observe, to take in a little written inspiration, to pause and enjoy the flavor of the hot brew on a cold day. Do it before the day gets away from you. Then return here and tell us about it. Time for tea… for you. Glad you’ve found your inner Brit! I wouldn’t be surprised if your lovely new tea set hails from the same area as I do – Stoke-on-Trent, in Staffordshire. We like our crocks in The Potteries. As many things as I have to do in a day my morning cup of tea (sometimes coffee… i have a coffee maker that makes just one cup) is my time. My daughter knows not to bug mommy while she is having her cup. During the day I always stop for another one, if only for 5 minutes, to re-group. The story on the tea pot from the lady is: I was moving into an appartment and met the daughter of the older woman who had just pasted away… I she discovered like her mother I loved tea… when I moved in the next day I discovered a beautiful english tea set and a note to enjoy them often as her mother did…it is still one of my favorite sets…. It is a reminder to me that it is the little things we do for others can have a very large impact on people. Enjoy your tea pot, your time, and most of all your memories. You’re so right about stories going with teapots. That’s one of the appealing things about tea, isn’t it? Thanks for these tea cup stories. Here is mine. A friend from Michigan gave me a lovely and unusual deep gold tea cup and saucer with a purple violet on them when I moved to Oregon. The next time I visited her I noticed that she had a tea pot and cup and saucer from the same set. She told me she had given a cup and saucer to three friends in faraway places so that we could all have a tea party with her even though we weren’t together. I think of that each time I use the cup. What an utterly delightful story! It makes me want to do that for my long-distance friends. Might be worth its own blog post – to remind us to treasure one another through a concrete gesture.